I was so happy to be back in the gym today! Three days away is two days too many! I got in a great workout and really tried to push myself on all the sets and reps.
Today was also day 1 of week 9 of working out on my plan and I'll be taking my measurements again this week to see what's changed in the last four weeks. 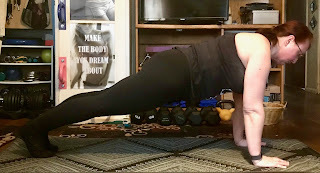 Tomorrow I have Pull Day C and I really want to make sure I push myself hard on my biceps because that's the one body part that didn't feel sore at all after last week's workout. So I decided that I'm going to do weekly blog posts on my journey to becoming a personal trainer and I'm starting at the very beginning with how to choose a program. Now, I don't know about you guys but I obsessively research just about everything before making a final commitment to it and this was no different. The things that I knew were that I wanted to become a personal trainer because I'm very passionate about fitness, getting healthy, weight loss and so on and I wanted to help people who started out like me: overweight, out of shape, with possible physical and/or chronic issues and illnesses so that's what I was specifically looking for. http://www.exercise-science-guide.com/certifications/personal-training/ and then followed the links and read more about each program. This site also offers a huge amount of information on various programs and delves really deeply int some of them including study guides, test prep and continuing education! 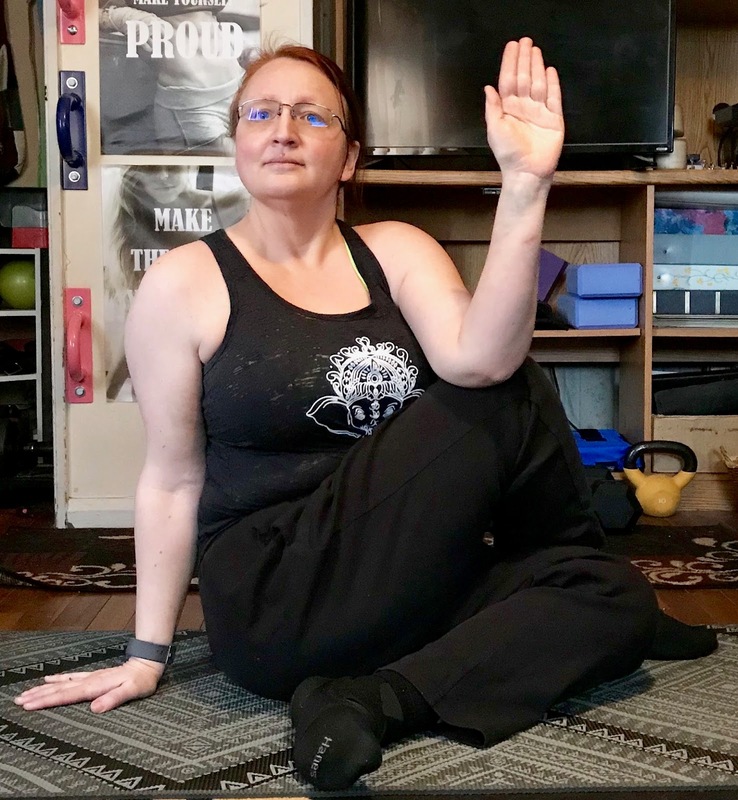 I also read through a lot of blog posts and message boards where people candidly spoke about what programs they used to get certified, the cost, the difficulties, how to prepare, what is needed, etc, spoke with actual trainers and spent at least a week, if not more, researching, thinking and planning before finally deciding on which certification to go with. I chose to go with NASM (National Academy of Sports Medicine) https://www.nasm.org/ for several reasons. It is widely accepted across most gyms, it's geared toward working with the population that I want to help the most and it's a highly recognized program that really focuses on the science of human performance. It felt like it was tailor made for me. Once you pick your certification program it's time to pick the actual program option you want to go with. NASM offers four different personal trainer programs at varying costs and several different ways to pay for those programs. I went with the all-inclusive package for several reasons despite the fact that it's the most expensive (you can usually get them at a discounted prices because there constantly seems to be one deal or another going on with them. I got it at 30% off plus I added in a specialization for half the cost and I'll be paying monthly for 12 months with no interest). There were several reasons I went with the all-inclusive, the biggest one being that it will give me 40 hours of hands on training at a gym that will be local to me (I don't know what gym it will be yet but they promised it would be within 20 miles of my location) and the fact that I like to get as much information, materials and advice at my fingertips as possible plus they offer a retest voucher and with a test percentage passing rate of only 64% the first time you take it, I wanted that voucher to be secured! Once I signed up for the program I was able to sign up for a specialization at the same time at half the cost (as mentioned above). Now, I had already researched all the specializations and I knew exactly which one I wanted which was the Corrective Exercise Training Specialization because it directly applies to my body and chronic issues and to the people who I'd like to work with so I was thrilled to able to sign up for it at the same time as the rest of my program. Here is a link that compares the various NASM specializations which really helped cement my decisions in the specialization that I wanted. That's about all it took to get me signed up and I think that covers the basic ideas of choosing which certification to go with! Next up will be preparing to start the program. My program officially begins on May 8th so I have about a week left to mentally prepare myself and I can't wait to get started! This was a great yoga week for me. I got to do a couple of poses I've never tried before and I got to do some poses outside which I loved! 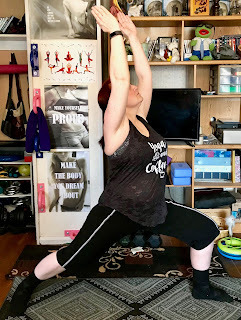 This coming week is the last one for the April Yoga Challenge so now need to pick one for May! 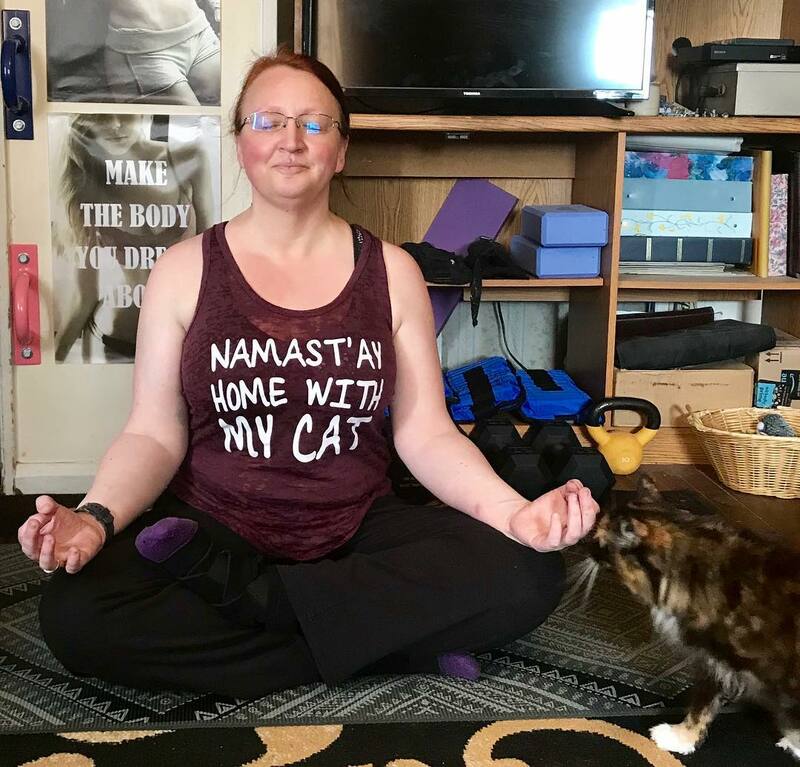 I'm having a slightly crazy weekend trying to fit in a lot of things into less time than I like so today I just focused on slow, relaxing yoga, tomorrow I have CPR/AED training from 8 am to 4 pm so probably just a yoga pose then and then sometime Monday (after all appointments) I'll be able to finally get to the gym! Another good loss week and this was with eating more calories daily! I've been really hungry the last few weeks, like, ravenously hungry, so I slowly upped my calories by about 100 calories a day or so on the days where I hit the gym. I'm less hungry, I have more energy and I'm still losing weight so woohoo! I'm going to keep playing around with it and see what happens. I'm still working on the protein part of it but I am getting in more than I was earlier so it's something. I'm still absolutely loving the gym so that will stay the same and food will pretty much stay the same in this upcoming week as it was this past week. 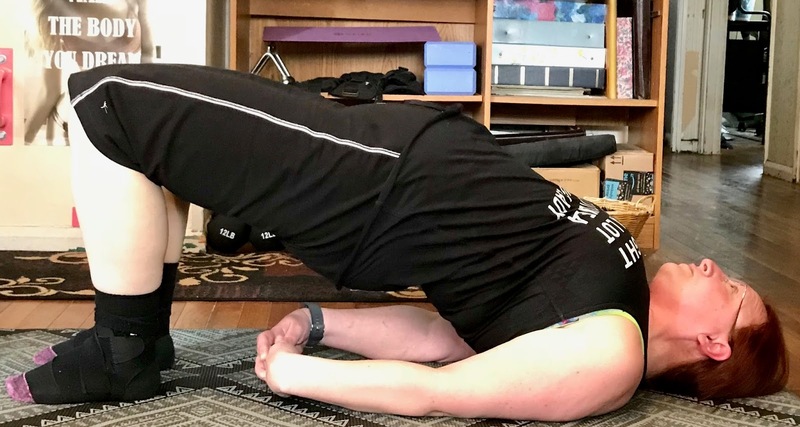 I'm also doing a "Vino and Vinyasa" yoga class at my trainer's studio tomorrow evening and Sunday I'll be gone all day working on my CPR/AED (defibrillation) certification. And somewhere in there I need to get some work in on my current pet portrait so... wow... I have a lot to do and limited time in which to do it in but I can figure this out! Ahhhh... another great day at the gym (despite how dead my legs are lol). I did the treadmill today because the Arc Trainers were taken but it went really well and my back held up great so it looks like I'll be able to mix up my cardio over time! 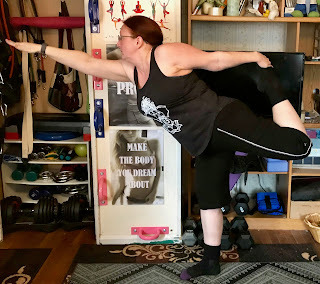 Tomorrow I'm doing a "Vino and Vinyasa" yoga class at my trainers' studio in the evening so I won't be doing my regular workout and I'll pick up with Gym Push Day C on Saturday (if all plans remain as they are now). Holy crap my legs!! Side squats are no joke! Besides how hard it was I loved today's workout and I can tell my thighs are getting smaller, especially as my newish size "Medium" workout shorts started doing that just about falling off thing today! Wooohooo! I may not be seeing huge progress on the scale but I can't wait to take my measurements again next week! Tomorrow is my weigh-in day and then I have Abs Day B! It felt so great to be back in the gym! I had a great workout and I really pushed myself on the Arc Trainer! My back has been acting up all day with a big knot in the bad spot of it but after a few hours of keeping heat on it felt okay enough for me to do some yoga. 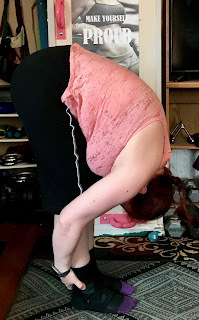 I did my regular yoga stretch (with one new pose added, today's Downward-Facing Dog challenge pose because I really liked it) and I held each pose for 20 seconds instead of the regular 15. I ended up with 42 minutes of yoga which isn't bad at all for a "bad back" kind of day! I am going to do something I've been thinking about for more than two years now and mulling over in my head all that time... I'm going to train to be a personal trainer! This is something I actually thought about way back when I was 19 and 20 and in college and even switched my major to something in that field for a while before returning back to focus on my art so, in reality, this has been in the works for a very, very long time. 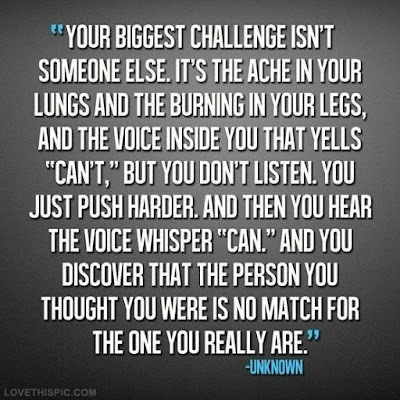 For the last year or so I've occasionally brought it up and joked about it saying "if I were 20 years now I'd so learn to be a personal trainer" and then last week someone very supportive (you know who you are if you're read this) said to me, "Go for it! Why are you waiting? 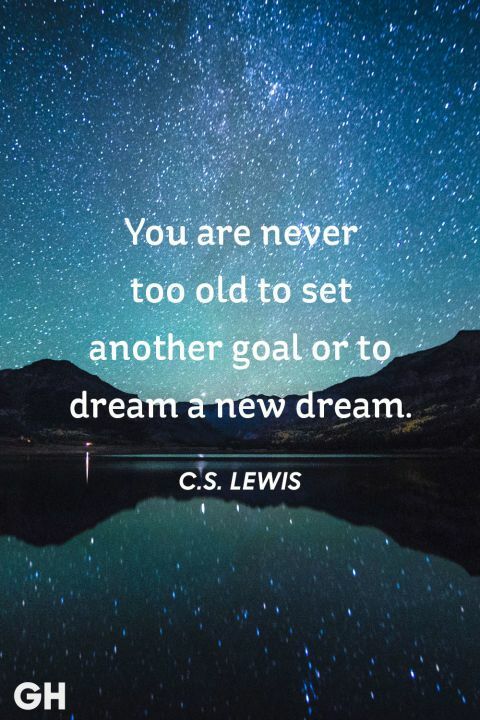 You're only in your 40's, you have lots of time to do something you love and are passionate about!" So then I mentioned it to Charles and, honestly, I have no idea why, but for some reason I thought he'd think it was a bad idea. No idea why because he's always supportive and he was all for it. Even after I mentioned that it would cost money he still encouraged me and, really, that's all it took. That one little push towards something I've thought about for ages and something I'm really passionate about. I really feel like I come from a great background to help other people who are are just coming into fitness or weight loss: I've lost a lot of weight, I LOVE working out, creating plans, planning workouts and researching new workouts and methods, philosophies, etc, I have chronic pain and illnesses and injuries that I work with and I'm older now so I may be more approachable to older or less fit people who may be interested in fitness. I think I have lot to offer and I'm not looking for a full-time job or to make a great living or anything. I actually love the job I job I have now and have no interest in leaving it but I would love to help others who came from where I did... out of shape and having no idea where to start and feeling incredibly self-conscious and convinced I can't get in shape or lose weight or be strong. I think my trainer is pretty much my biggest role model and inspiration in all of this! She helped me change my life and I've never been happier. I want to give that back to others and I want to show other people, especially women, how much they can actually do and what they can accomplish! I'm going to get trained and certified through NASM (National Academy of Sports Medicine) with a specialization in Corrective Exercise which is perfect for what I want to do. I also get to do 80 hours of hands on training which should help me a lot! I am slightly terrified over the final exam (64% passing rate) that I'll have to take in six months but I'm smart, I love learning (and, gosh darn it, people like me ;) ) so I think I'll be okay. Eventually I also want to get special certifications in things I really want to focus on; forms of yoga, possibly Pilates, things like that, but for now my focus is the NASM training! I'm getting started today and I'm already signed up to complete my CPR/AED (external defibrillation) Certification this Sunday (it's one of the requirements). I'm really excited about this and I can't wait to start learning! 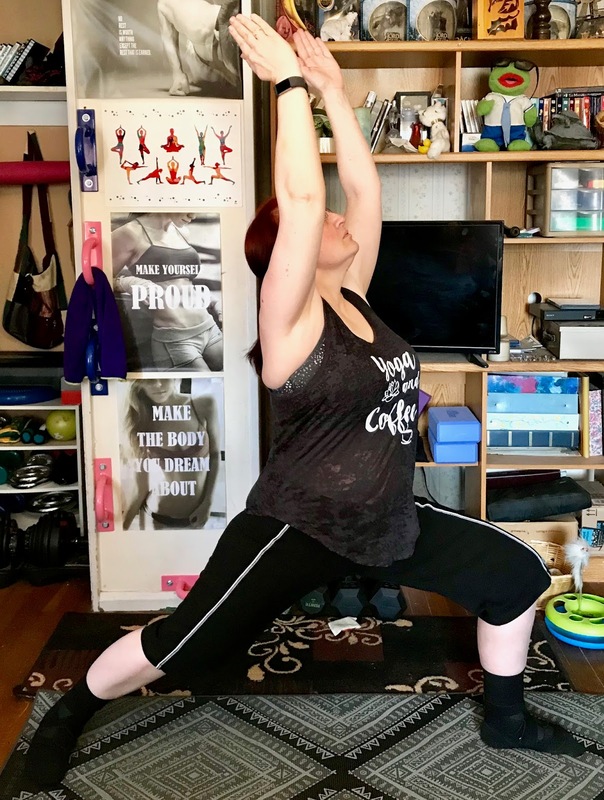 Everything else I do is remaining the same: I'm still doing keto and working on losing the rest of the weight, I'm still going to do my workouts at the gym and home, I'm still doing the yoga challenges, the only thing that's changing is I'll be learning and studying something new! So, that's my big announcement! Please wish me luck as I start out on this journey and I'll keep you guys updated as I go! I almost forgot to post this today but remembered right at the last minute! Woohoo! 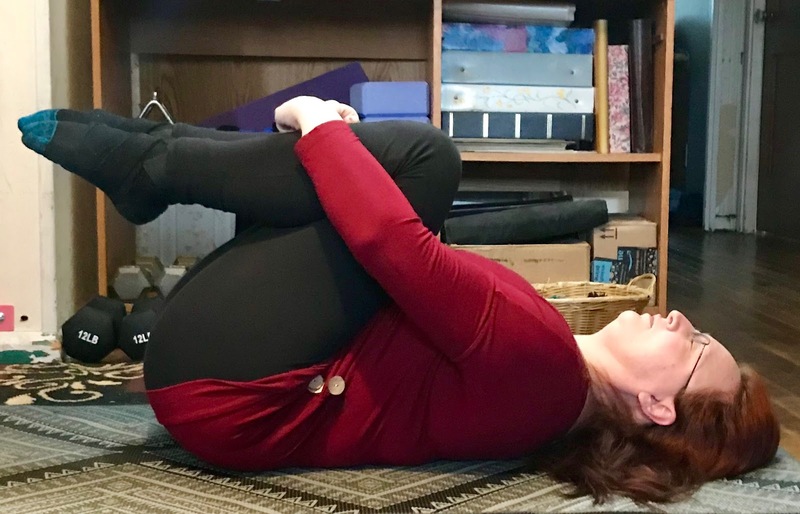 Loving my week of yoga poses so far and looking forward to the coming week! I love the gym every day that I go but tomorrow I'm taking a much needed rest day partially because I need one and partially because we have a busy day tomorrow as it is. But I'll be back at it on Monday with Pull Day B! I had another great day at the gym and really pushed myself on the Arc Trainer! I think that's going to be my chosen method of cardio over the treadmill on most days! Tomorrow I have Push Day B and then a rest day on Sunday! I had a fantastic Leg Day A workout at the gym and while I'm not sure I'll be able to to walk tomorrow, I loved it! Even those freaking walking lunges! I did the treadmill again for my cardio workout but my back started acting up by 30 minutes in (so I stopped it there) so it's probably back to the Arc Trainer tomorrow if my legs can handle it. I finally had a good loss and while I'm happy about it I'm more excited about seeing developing muscles and how much stronger I am now which I think it's a great change! Yes, I need to lose more weight and I'm not stopping now but it's great to not be obsessing over every little number shift and change! I'm mostly leaving things with food the same as they have been except that I actually need more calories and more protein if I'm going to be putting in around two hours at the gym a day so I'm figuring out how to take care of that. It's a fine line to walk because too much protein and too many calories mess up my weight loss but too little leave me starving and just wanting to eat everything in sight. I guess I'll just have to take it day by day until I find a good compromise between the two! As for exercise, I am absolutely loving the gym and the only thing that I'm changing is switching my focus from 10,000 or more steps a day to getting in a really great cardio workout when I’m at the gym (plus nature walks once the weather warms up) since I have cardio options again and because of my ankle has been acting up again. I’ll be doing less steps and mileage but more fat burning and heart rate raising stuff so we'll see how that goes. I've also been contemplating the idea that I may not be able to reach my goal weight and how to be okay with it if I don't. 130 lbs is good for my height (some would say it's even too high) but when I was 130 lbs back in high school that was a "skinny fat." 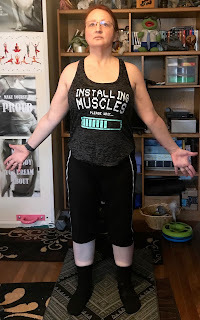 There were no visible muscles and no exercise so I don't even know if I can get to that number again while working out like this and at 20-some odd years older. I'm going to try and not obsess about it right now though. I really want to get into a healthy and no longer "overweight" BMI (I know, I know, BMI shouldn't always be trusted but I still want that "healthy weight" status) and that would put me at 141 lbs. So maybe if I can get there I'll reconsider my goal weight after that and see which way to go. In the meantime, wooohooo for the gym and muscles! I had another fantastic day at the gym and I'm very nicely sore from yesterday's workout! I even managed 30 minutes on the Arc Trainer (instead of the treadmill because my ankle was acting up again). The last time I tried the Arc Trainer (it's like an elliptical but moves slightly differently) I managed 10 minutes and felt like I was dying so this was awesome! I also used the heavy ropes as part of my warm up and just had a great day. Tomorrow is my weigh-in day and Leg Day and, God help me, I can't wait to tackle my legs at the gym! Wooohoo!! 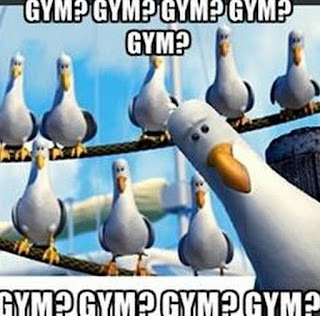 OMG....I LOVE the gym!!!!!!!! (like I knew I would lol). 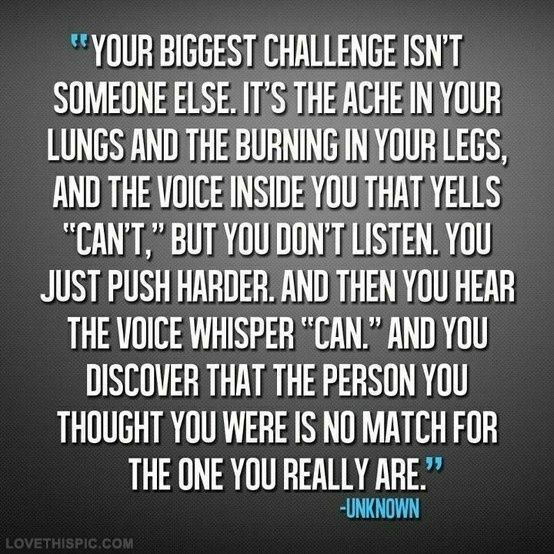 No matter how hard I tried to work at home it doesn't even compare to how I can push myself at the gym, I am hooked!! I was sweating more, breathing harder, working harder and really pushing myself and it felt great! Even the treadmill went really well so I'm glad I can incorporate cardio into my plan again! 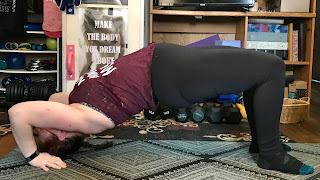 It was also great to see everyone again and I was able to make sure my form was correct on a couple of exercises and that I was doing them right which was extremely helpful (and better than just trying to learn from YouTube videos). I can't wait to go back tomorrow after work for Pull Day A! Yes, I am finally and actually going back to the gym (at least to try it out but knowing how much I love it when I'm there, I'm probably going to keep going). 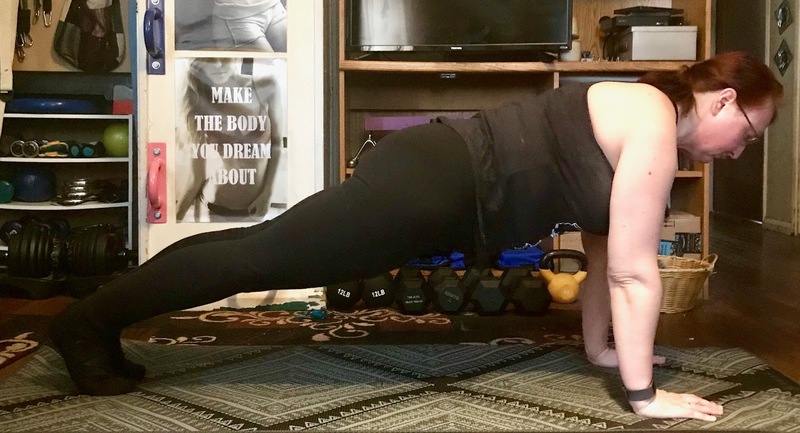 There are several reasons for this because, really, all I've talked about lately is how much I love working out at home so why change that? Well, there are also limitations to home and I decided that since I'm paid up until the end of April, I may as well go and give it a try before just deciding not to go at all. 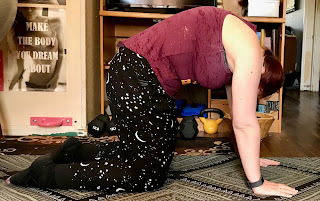 The biggest problem I'm having with home is that a lot of my anchored band exercises are really meant to be cable machine exercises and I can definitely tell that I'm not getting the right kind of workout on some of the moves I did over the last seven weeks of working out. Like, the standing anchored band chest press for example. It feel like I'm working hard on the actually press part but when I come back from that press, I should be feeling the exercise more and instead it does nothing. I think if it were being done with the cables and weights attached to them, I'd feel it more going in both directions and this seems to apply to a lot of my anchored band exercises. I also really miss the kind of workout I was getting from some of the machines plus I'm quickly outgrowing my equipment and I can't keep buying more and more of it every month. That's costing me more than a gym membership does! Plus, of course, cardio machines! I have this incredibly stubborn fat on my stomach and midsection area. I can feel the muscles underneath the fat getting stronger and I have really good core strength but the fat covers all of it and it seems like I'm losing weight everywhere but there! Honestly, it's really starting to bother me! I love doing the 10,000-12,000 steps a day and I plan to keep that doing that, but I think adding a half hour or more of really serious cardio... treadmill, arc trainer, elliptical... whatever, will really help with that stubborn fat! My workout is already planned and ready to go because I worked on it for several days over a month ago when I was considering the gym back then. It's the same basic set up as my at home workout... Push/Pull/Leg/Abs Days A-G and includes a great mixture of weight machines, cable machines, resistance bands, free weights, body weight and Pilates moves so the basic plan will remain the same. I still want to workout 6 days a week (with 1 rest day), I'm still going to do my yoga challenge and daily yoga stretch (I need to finalize that with the new moves I'm adding) and the only thing that will change is I'll be at at the gym instead of at home (and if I need to workout at home for some reason, my workout and current equipment will be waiting for me). I'm also bringing some of my own stuff to the gym, mainly my yoga mat and I have permission to bring my own ankle weights because I need them for a lot of my leg exercises and Snap doesn't have any. 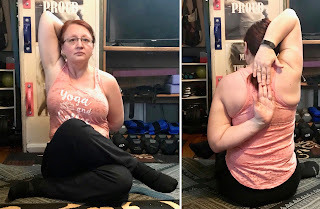 I'm probably going to hold off on the Yoga Stretch at the gym and stick to doing it at at home because that's where my blocks and straps are but I'll see if the gym has any yoga stuff before making a final decision. Plus, of course, time constraints. I'm just going to go day by day and see what happens. 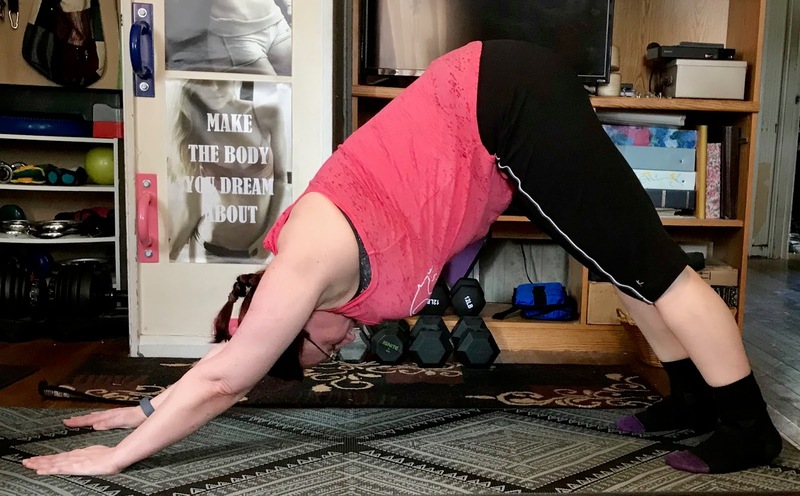 And, finally, I feel like I need a greater challenge and that I will be able to to push myself harder at the gym because the equipment is there for me to use. Eventually I want to learn to use the squat rack and barbells but that can come a little later. I would have already started this weekend but today turned into a high pain day and we're under a winter weather advisory for some snow, freezing rain and ice so tomorrow we'll probably be stuck here, but as soon as it clears up on Monday I'm going and I really can't wait!! I'm having a great week with the yoga poses and yesterday's lesson will definitely help me do them more correctly and with more confidence! Another exhausting yet awesome workout done and tomorrow is my weigh-in day and my much needed and well deserved rest day! 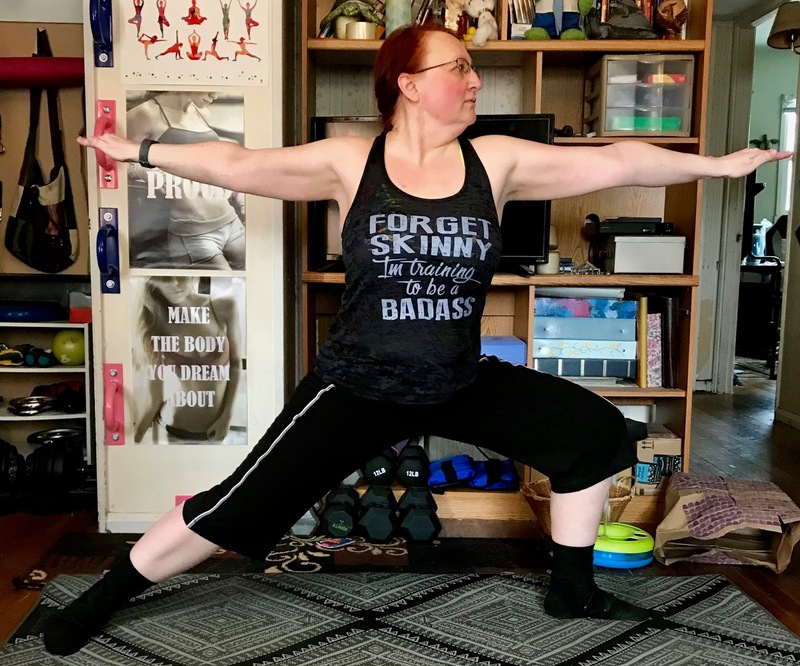 Leg Day B and a private yoga lesson on Friday! Wooohoo! Working Out ~ Finding What You Love to Do... Long! Okay, so maybe there's also a smidgen of obsession when it comes to working out for me (Charles, you be quiet!) 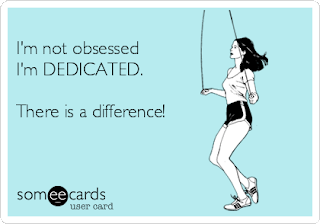 but for the most part, it really is dedication. I've gotten some comments recently on how much I work out and how well I'm sticking to it so I wanted to talk about that. The reason I can stick to it so well and be someone who works out six days a week (at least for the last six weeks) is simple... I love what I'm doing and I think it's incredibly important to feel that way. It's true that I don't love every single exercise that I do. 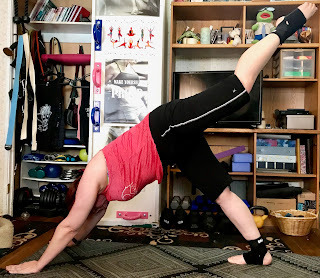 Walking lunges aren't really my friend and there's quiet a few ab exercises I could do without but they're part of my program because, in general, I love strength training. I love how it makes me feel (physically and mentally) and I love the results! I look forward to every workout and I carve out time for them even on days when I'm really busy. I even look forward to Leg Day lately which is a huge change for me. Now, if I had to do something else that I didn't enjoy, like most cardio workouts, dance-workouts (I have the rhythm of a stick and I'm clumsy) or even running, I wouldn't be able to do it six days a week because I don't want to do it. I know I would drag my feet and make excuses and it just wouldn't happen. Those things are not something I ever look forward to and they're not part of my plan for exactly that reason. 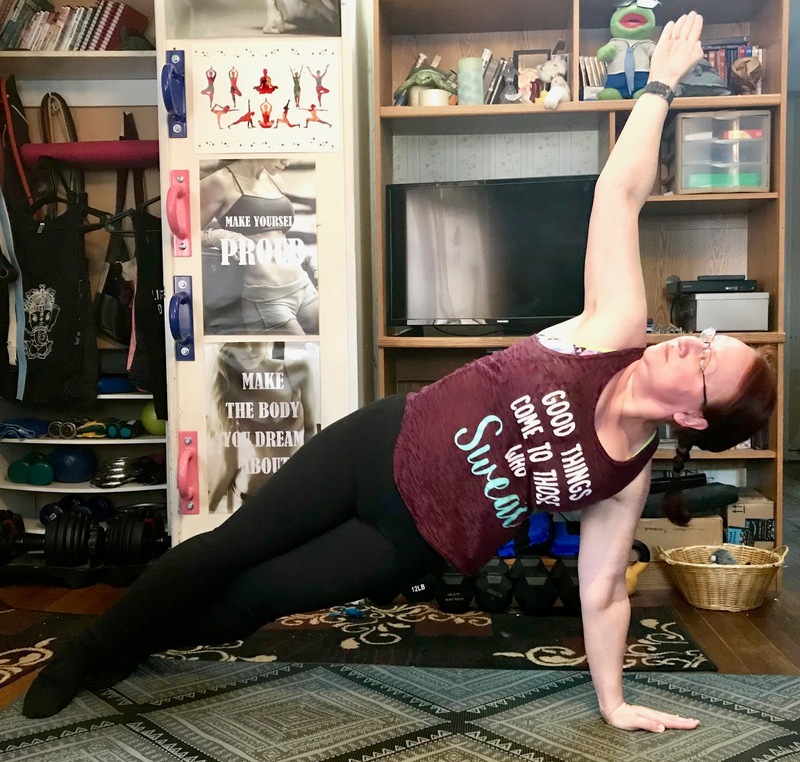 I love working with weights, I absolutely love yoga, I love Pilates, I'd probably love Barre if I got around to doing it, I love waking, especially outdoors and in nature areas, and we're adding an actual hike to the plan in the fall. I'm not a big fan of classes so I don't do them. I don't dance, I don't run (or ever plan to run) and I currently don't lift heavy at the gym because of how happy I am at home doing my own thing. At some point in time that may change but we'll see. I also have no interest in competing against others but I absolutely love competing against myself and how I worked out the previous week/month/program run-through. And I work out for about an hour and a half a day give or take 15 minutes plus I walk 1,000 steps every hour in order to make my daily step goal. Does someone have to work out for that long every day? Of course not, but I love my workout time. It's my "me" time. 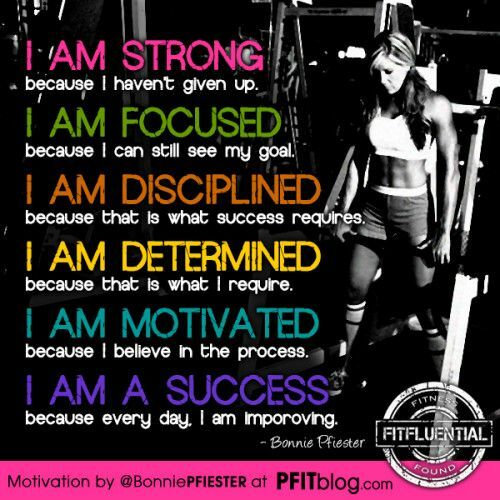 I focus on me: my body, my muscles, my strength, my flexibility, my feelings. It is truly and fully about me, for me and against myself and I look forward to it every single day no matter how hard it might be or how hard I have to push myself or how much it will hurt (in a good way)! 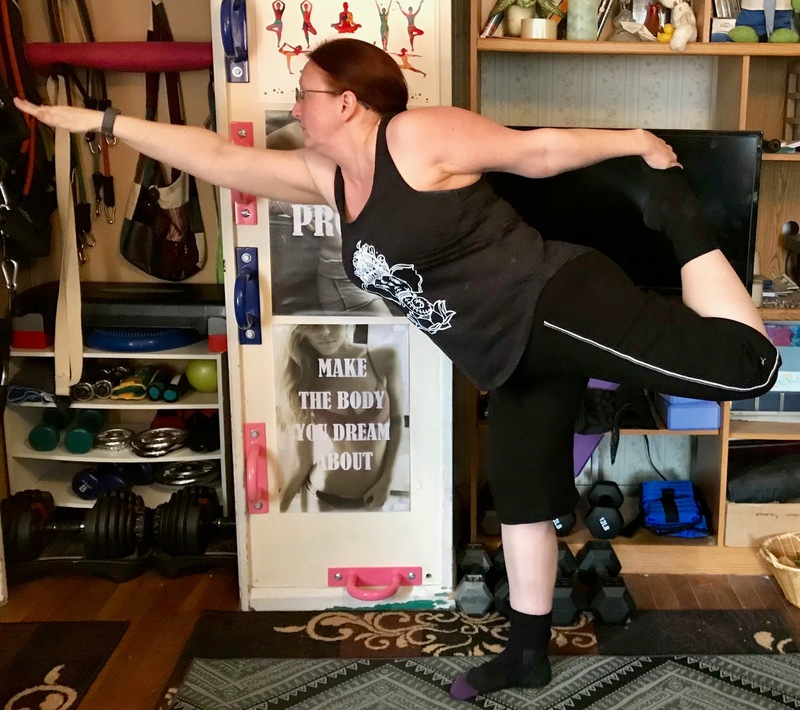 I love how I feel when I'm succeeding at lifting a heavier weight, or squatting lower, or holding my yoga pose better than the previous time doing it and I absolutely love the endorphin rush I get from my workouts. Plus, let's be honest, I'm starting to love how I look after working this hard and the fact that I can eat more food on workout days and still keep losing weight! Now, some people don't have the time that I have to spend on working out and that's fine too. It's not really the time, it's the effort you put into the time that you do have. You could do a workout for 10 minutes or for 3 hours and still be able to make it a decent workout! It all depends on what you want and how much you're willing and able to to do. It's all in your hands. Those are the things I like and the things that make me happy but not everyone has to love and do what I do. Every now and then, especially when I'm showing him my newly developing muscles, Charles comments that he should do something too but he hates to exercise and you know what, that's fine! There's nothing wrong with that, he just needs to do what he loves. I know he loves walking outside and hiking and working in the yard/garden and that time is coming soon plus nature walks are something we'll do together. Should I be trying to convince him to lift weights because I do? No! I know it's not his thing and I truly believe that you will never stick to something that you hate to do. I say the same thing about diets and keto. You have to find what works for you and what you won't mind doing! 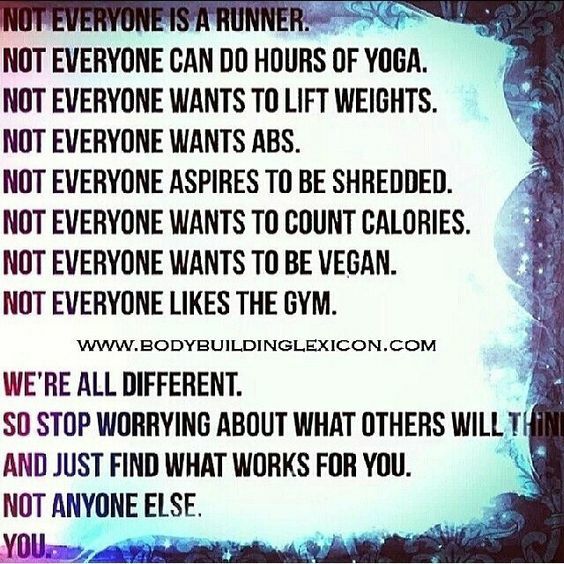 Everyone has to find their own path. Some people dance, some run, some do workout DVDs or classes, some go to the gym, some work out at home, some do yoga, some swim... I could go on and on here. The secret of sticking to it is to do what you love. 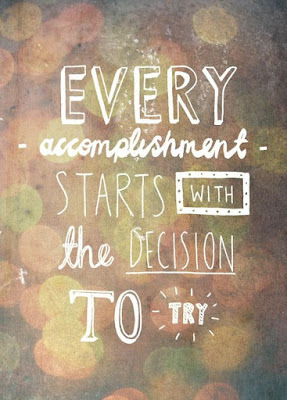 And who knows, maybe you'll end up trying something just to try it and finding yourself falling in love with it! 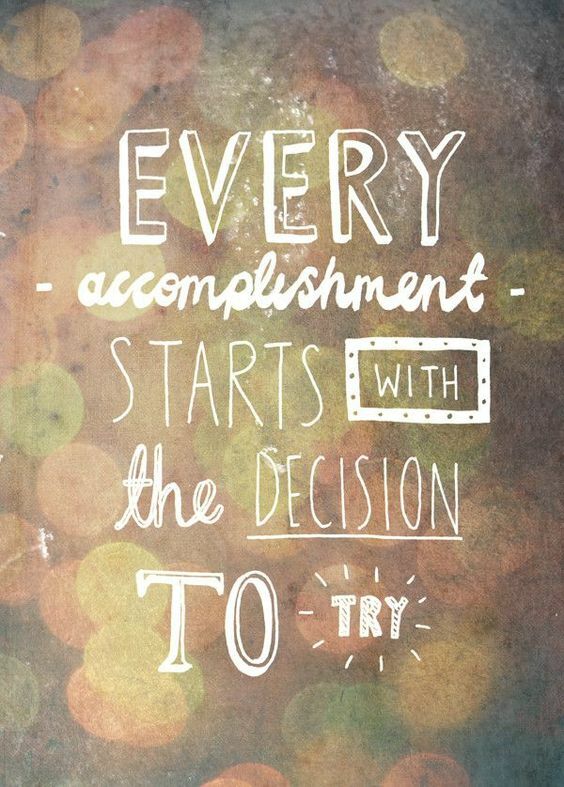 So if you want to exercise, go pick something and just give it a try. You might love it, you might hate it (and if you do, just move on to something else) but you never know what you might discover about yourself until you try! Christ is Risen! Happy Pascha!! 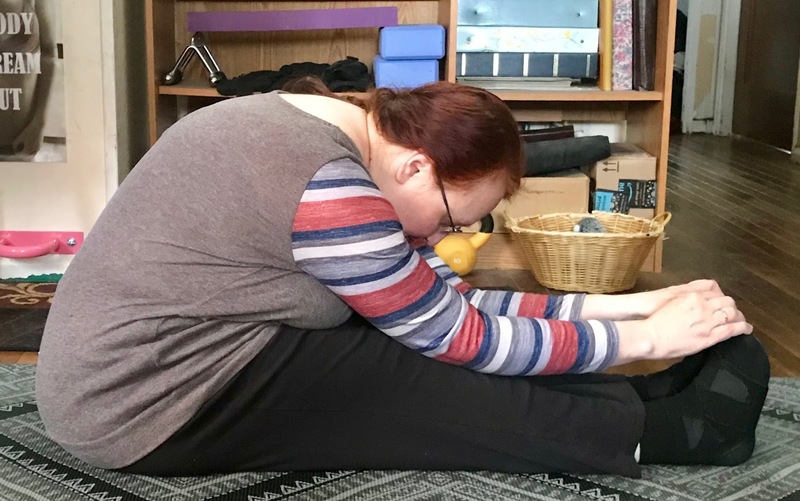 It has been an exhausting whirlwind of a weekend with the Pascha services and feasting afterward but it was wonderful and I still stuck to my plan and worked out! I ate mostly keto foods except for a bite or two of really amazing cheese pascha a good friend made for us as a surprise (she makes THE BEST cheese pascha) and two small pieces of really good chocolate. 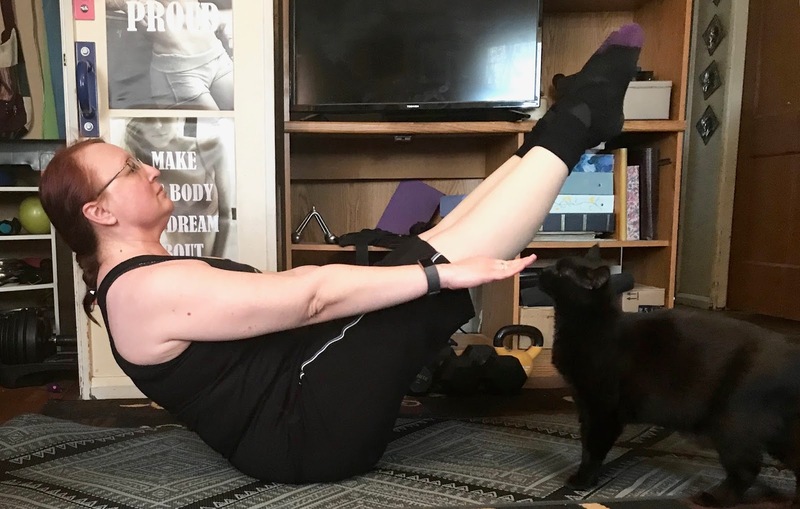 Last year Pascha would have been an excuse to binge and skip working out! This is so much amazing progress and I'm thrilled with how it's worked out. I don't know how many calories I ate but it was reasonable and while I don't know exact carbs for today it was definitely under 50 net (or possiby 50 total)! Also, my ankle is doing much better after some rest so I should be able to get back to my regular steps tomorrow! This week started the April yoga challenge and so far I am loving it and I am definitely progressing in my confidence and ability to do these poses! Today I started round 2 of my plan with Push Day A and I was able to go up on almost every weight and band! I went from a 40 lb band to a 50 lb band on the standing chest press (and exchanged the handles for the bionic bar), from 10 lbs and 8 lbs to 12 lbs and 10 lbs on the flat bench fly, from 20 lbs to 30 lbs on the anchored band lateral raise, from 5 lbs and 8 lbs to all sets at 8 lbs on the scarecrow, from 20 lbs to 30 lbs on the tricep pushdowns (and exchanged the handles for the tricep rope) and from two 5 lb sets and two 8 lb sets to all sets at 8 lbs on the crossface extension! This is great progress! 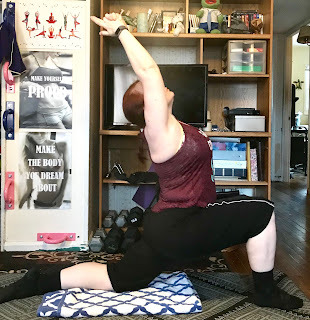 I also did my first run through on my new yoga stretch and absolutely loved it and it only added an extra 8 minutes to the routine so that's definitely worth it! 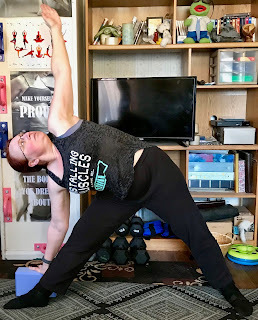 First Full Workout Plan Run Through Thoughts and New Yoga Stretch! So, as I posted earlier, yesterday I completed the first full run of my entire Push/Pull/Legs/Abs Days Workout and I learned a lot from that. 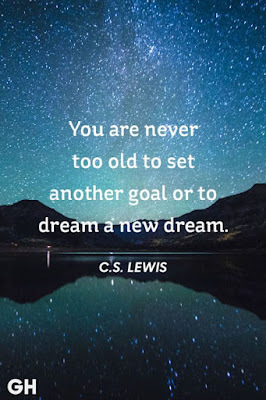 First, I learned that I CAN stick to one plan and see it all the way through which is huge for me because I usually go back and forth so much it drives me (and everyone around me) crazy! Second, I learned that I can put together a good plan! I love variety, I love the Push/Pull/Leg/Abs line up, I love not repeating the same thing for a while and working my muscles from all different directions and angles and throwing in some pilates moves into nearly every workout so I used all of that, plus what I learned from my trainer, my gym membership and my own research to create a plan I loved doing! Yes, it was hard at times, yes, there was a day or two where I was ready to swear at whatever (especially that leg day that had curtsy lunges and squat side kicks and Bulgarian Split Squats and Bench Hip Thrusts plus more) but I love working hard and love the soreness that follows afterward! 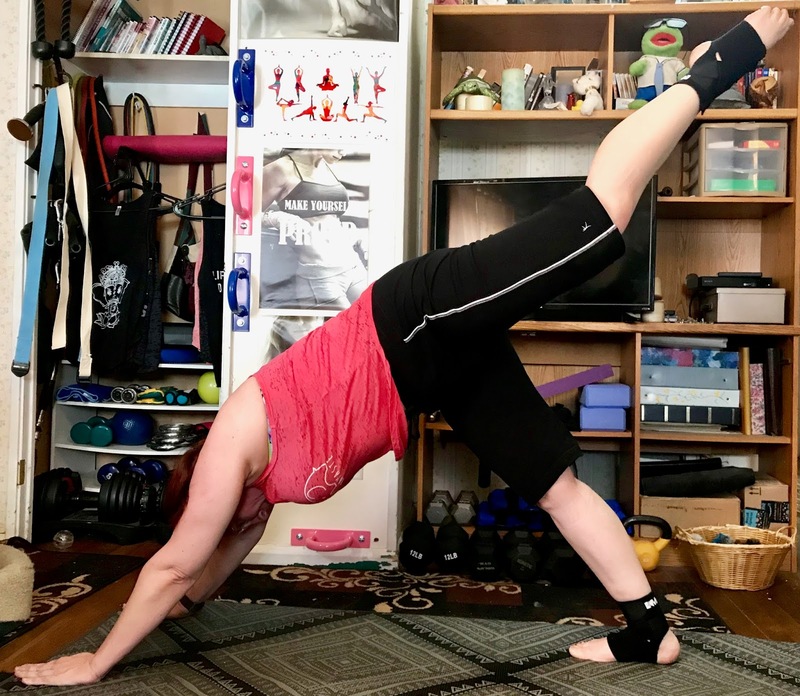 I learned that I am definitely a "home workout" kind of person right now and that I can get stronger at home, I just have to slowly add heavier and heavier dumbbells to my ever-growing gym! 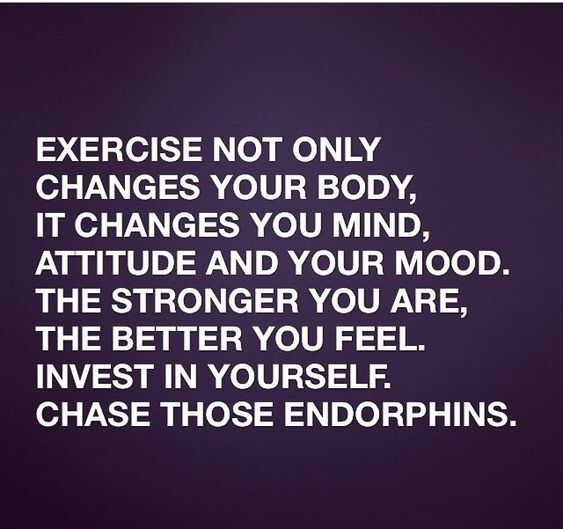 I learned that I don't need a specific cardio workout and that I'm happier with hourly walking (and adding more and more stairs as I go) and my back does much, much better with that too. I also end up with way more steps, miles and distance walked than I would get in one 30 minute cardio DVD workout! I learned that I am capable, I am determined, I am strong and I truly love working out! And I discovered my absolute love for yoga hence the new yoga stretch! I also made some smaller tweaks to certain exercises as I went along. The renegade row had to become a modified renegade row for now, I definitely need to add ankle weights and some bands to things like clams, leg lifts, floor hip extensions, etc, I added new anchors because I didn't have enough height varieties for all the exercises I wanted and I feel ready to start incorporating practice assisted pull-ups and hanging knee-ups for abs using my pull-up bar! For the last two I'll probably add 1 or 2 pull-ups on pull days and 1 or 2 knee-ups on abs days but they're not going to be the focus of the plan yet, just general practice. 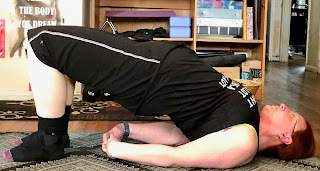 I also learned that it's much better to double check YouTube to see how an exercises should be done than to guess, do a bunch of reps, realize it doesn't feel right, then look it up and figure out, yup, it wasn't being done right! From now on I check first, then do! So now I am ready to start my plan over again for round 2! I'm going to change up some of the accessories I used and some of the ways I held my weights to give it even more variety and I'm obviously going to continue upping my weights and band amounts as needed. I also feel more confident going into round two because now I have a much better idea of what I'm doing! And here is my brand new, almost-all-yoga stretch! I really wanted to be able to practice a lot of these poses daily so this plan is what I ended up with it (thank you again, Dawn, for your help!!). 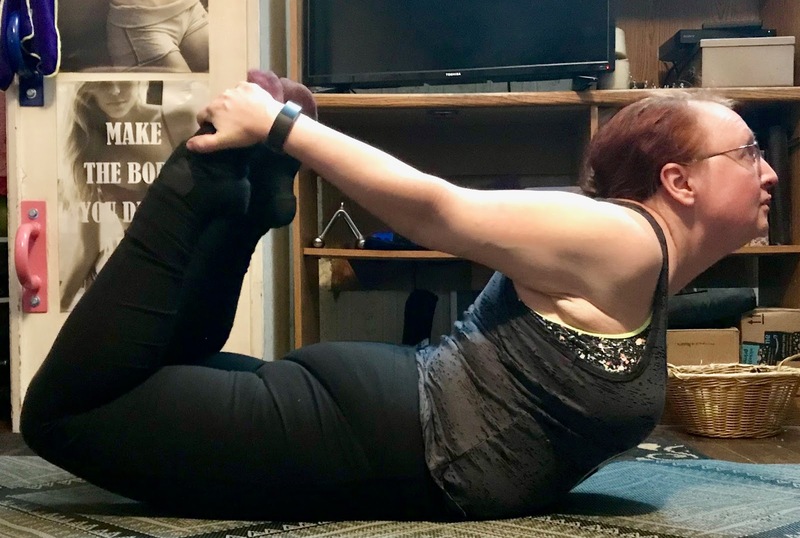 It'll definitely take more than my previous 20 minutes spent on stretching but I'm ready for that and looking forward to it! The images here came from Spotebi.com just to give credit where credit is due! The poses will go in the order posted unless I want to change something as I run it for the first time tomorrow and see how it flows. I'll also continue to do the daily yoga challenge poses along with this! So bring on round two because I am ready!! Yes!! I'm FINALLY back to my pre-Christmas weight of 159.6 lbs! So I dropped 0.4 lbs this week which is normal because it was my "small loss" week. So it took 5 weeks to gain that weight back and almost 10 weeks to take it off but at least it's off now and I can start losing "fresh" weight from here on out lol! Plus I'm more fit and my clothes fit much better today at 159.6 than they did on my last pre-Christmas weigh-in of 159.6 so that's great progress! I'm also at 67 days cheat free and I already ordered my 75 day cheat free tank top reward. I wanted to get it early because it's a tank top brand I haven't gotten before so I'm not sure if it'll fit right or if I'll have to exchange it for another size but I won't be taking pics of it until I actually hit the 75-day mark. This Saturday night we have Pascha (with all the amazing food I'm going to choose not to have) and more of the same on Sunday. This will definitely mess up my workout routine but I'm going to hold firm on my food plan and everything should go well. Hoping to see a new lowest-weight weigh-in next week! Great Leg Day workout today and tomorrow is my last "G" day with Abs Day G and then I will have run my entire program once! Wooohoo! Pull Day G is done! I was able to go up to 20 lbs from 15 lbs on my shrugs, to 15 lbs from 10 lbs for the row and 1 set of 10 reps at 12 lbs (10 lbs for the rest) for my chest supported bicep curl!